Stud Mix is a proprietary blend of nutrients designed to improve and maintain male health, function, and overall well-being. Stud Mix is composed of quality herbs and amino acids, specially formulated to naturally achieve and maintain male hormonal balance, prostate health, and to restore energy and libido while potentially helping erectile dysfunction. Stud mix contains Tribulus Terrestris, arginine, saw palmetto ornithine and lesser amounts of other synergistic moieties. Stud mix is a cost-effective alternative to Viagra and Viagra-like medications. Useful for E.D. as well as BPH. Testosterone levels will increase and estrogen levels will decrease. 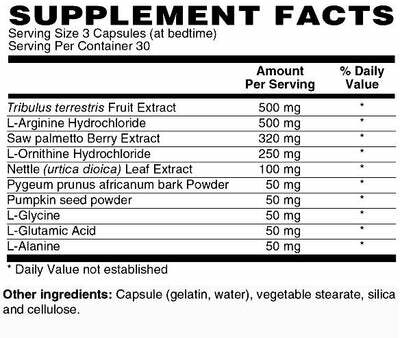 Three capsules are taken at bedtime. The effects are noticeable in as little as three weeks but may take longer in individuals with low testosterone and elevated estrogen levels.